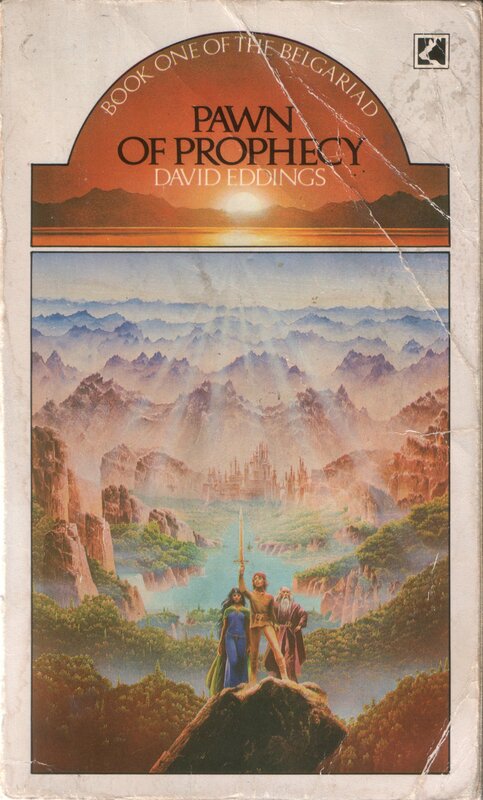 I finished watching Children of Earth, and I want to write about how good it is. But before I can do that properly, I need to write about how gut-wrenchingly horrible the first two series of Torchwood were. On one hand, a juvenile program about a bunch of overgrown children who run around chasing ghosts and obsessing about trivia; on the other hand, Scooby Doo. Thank you, thank you, we’re here all week, don’t forget to tip your waitress! In 1997 or thereabouts, a friend’s wife lent me a book that she thought I’d enjoy. Three years later, my family and I moved to a different part of London; a couple of years after that, my friend’s marriage broke up; fast forward a few more years and we moved out of London, I got a Ph.D in palaeontology, my wife got an MA in Music Therapy, I started writing The Reinvigorated Programmer … and the book remained unread. I just can’t make myself read it. I just want to post this brief note as a counterbalance to my recent post on How much I hate Torchwood. Despite the delay described in that post, I did slog through to the end of the Series 2, and it was just as risible as I’d feared — I mean, astonishingly shallow and childish, appallingly written and dreadfully acted. So I went into Series 3 (Children of Earth) with low expectations. But having now seen the first three of the five episodes, I have to admit it’s much, much better than I’d dared hope. Each of these three episodes has been far better than anything in either of the first two series. In the last few weeks, inspired by my Index Data colleagues Adam Dickmeiss and Jakub Skoczen, I’ve started running. 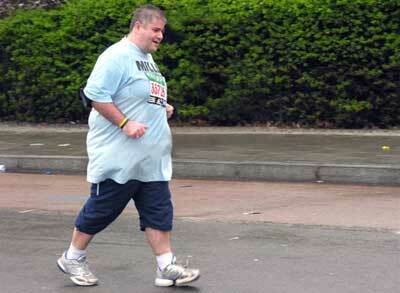 Humilatingly short distances, and at laughably slow paces, but running nevertheless. I’m forty-three, I weigh over a hundred kilograms, and I absolutely love good food and drink. If I don’t do something, it would be terribly easy for me just to slowly but inexorably get fatter and more unfit until I keel over. For avoidance of doubt: this is not me. So far I have run four times, racking up a less than inspiring total of maybe three miles. So you might want to take what I say with a pinch of salt. Still, I feel like I got a general insight on yesterday’s “run”, if you want to call it that, and as usual I am arrogant enough to assume that the world ought to be told. Who the heck is this meant to be for? It’s the dialogue that WordPress gives you when you want to make part of the text of your blog entry into a link. 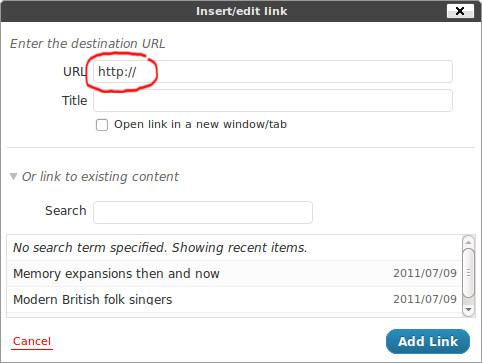 And the URL field comes pre-populated with a fatuous “http://&#8221;. This saves me 0.4 seconds of typing on the one occasion in 1,000,000 that I intend to type the URL by hand. On the other 999,999 occasions, it means instead that I have to highlight and delete the unwanted text before I can paste in the URL that I’ve copied. 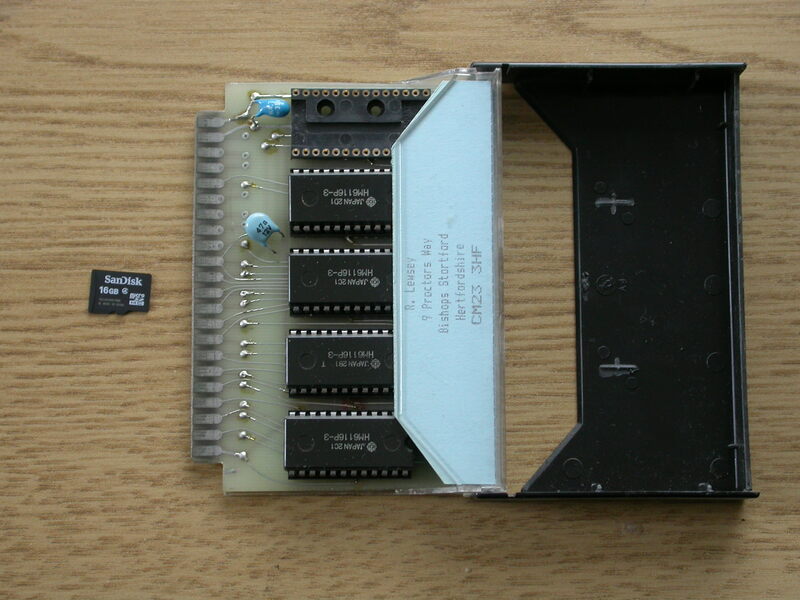 Thirty years ago, when I was about thirteen, I got a memory expansion for my VIC-20. (I told the whole story a while ago). Now, my eldest son Daniel is thirteen, and to congratulate him for an excellent set of end-of-year exam results, I bought him a memory expansion for his MP3 player. Mine is on the right; it provides 8 Kb. Daniel’s is on the left: it provides 16 Gb. So that’s two million times as much memory. We’re living in the future. I’m looking for a bit of help here. One of the styles of music that I love is what you might call “modern folk” — I don’t know if there is a proper name for it. What I mean is reasonably sparse singer-and-a-guitar songs, cleverly written to be about something. Current examples would include people like Dar Williams (listen, for example, to her song February or When I Was a Boy) and Richard Shindell. Older and maybe better-known examples would be Paul Simon, Joni Mitchell, and a band like Crosby, Stills and Nash.